I love bringing the outdoors in and one of the easiest and most budget-friendly ways I find to do that is to make a wreath. 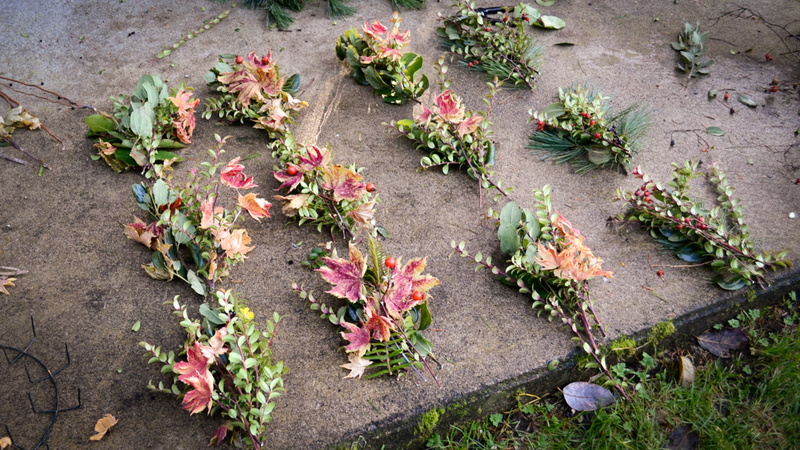 Any time of year you can take a ‘wreath walk’, gather some seasonal prunings, and make your own wreath. Grab your hand pruners and a hand basket to carry your finds, and let’s go foraging! Look for whatever you can get your hands on that inspires you. I always try to look out for bits that represent the season. Why limit wreaths to only the winter holiday season? 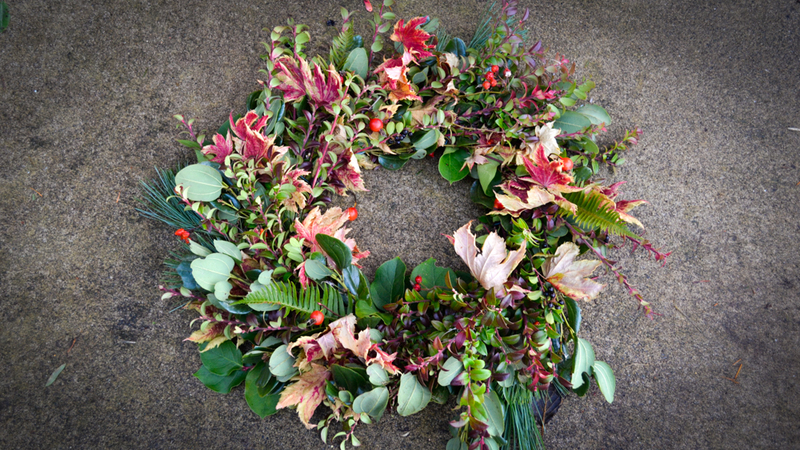 Do wreaths year-round – spring, fall, whenever. 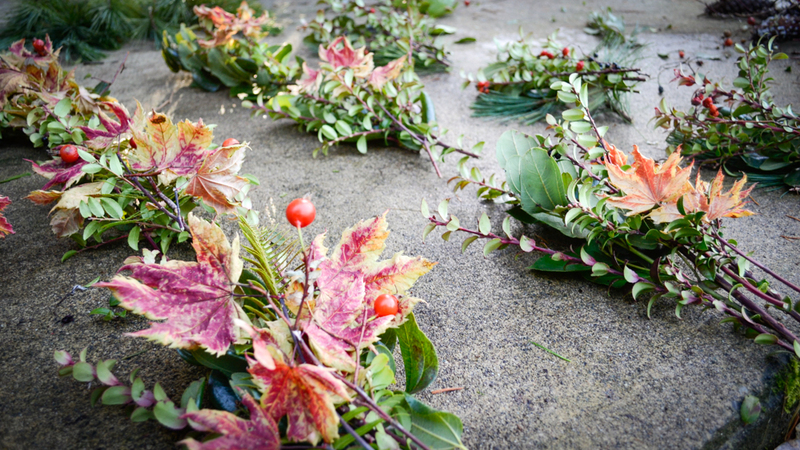 Branches, brush, berries, cones, dried flowers, herbs, rosehips – you get the idea. Most of us have access to a bit of nature somewhere. For now, our family lives on the edge of forest land so I just head out the trail in our backyard. At other times I have had to get a little more creative to scavenge materials – rural roadsides, my mother-in-law’s yard, etc. Go out into the woods. 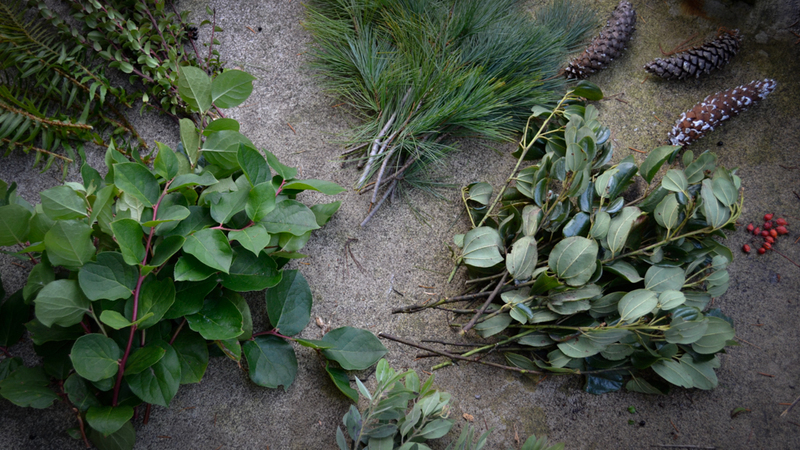 You can get a personal use permit to collect wreath making materials on USFS and BLM lands, usually at little to no cost. Use the prunings from regular yard maintenance. Roadside trimmings. We have to cut back the brush along our one-mile neighborhood road every year or so to keep it under control, nobody minds if we pick materials for bouquets or wreaths along there. …just to give you a few fall or winter wreath material ideas. Space to build your wreath. It is nice if you have a big, sturdy workbench to use. I don’t, so I use my patio. A clamp-style wreath frame. Wreath frames come in various sizes and shapes, are not expensive if you can find a good source, and can be reused. I have mine from a few years ago, that is what I am using today. You can pick one up here from Amazon. 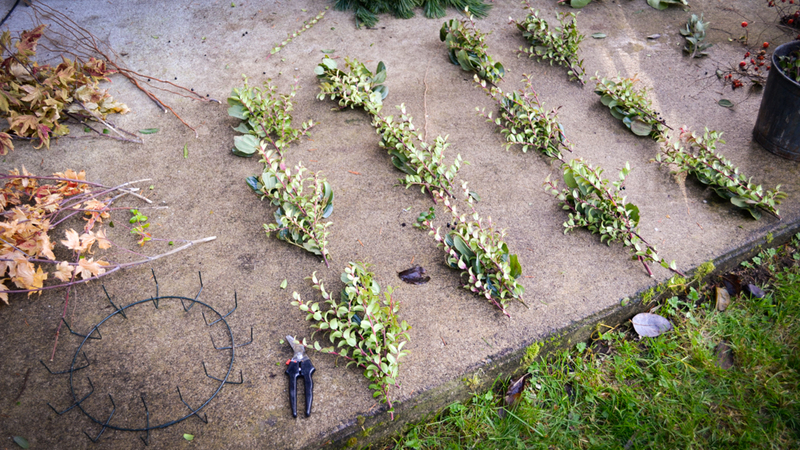 The pruners you used on your wreath walk. I always lose my good ones so today I am using whatever I could find that would get the job done. The wreath making materials you collected. A bucket for your compostable wreath making scraps (that will go to the compost when we are done). 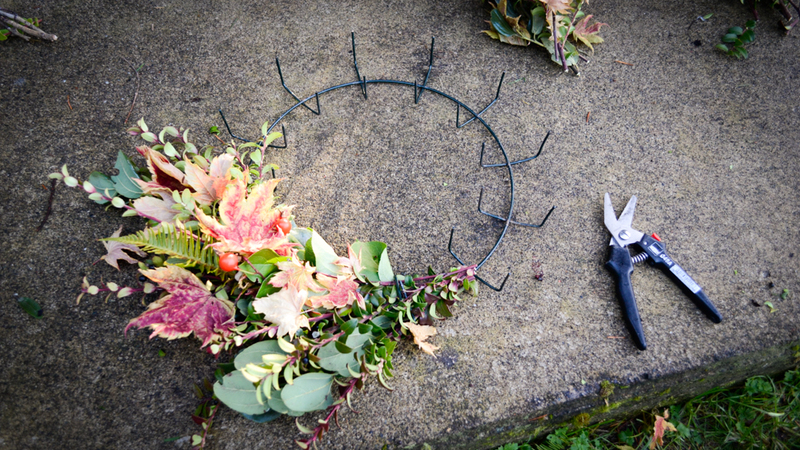 To put your wreath together, you will make mini bouquet-like bunches, one for each clamp on your wreath frame. 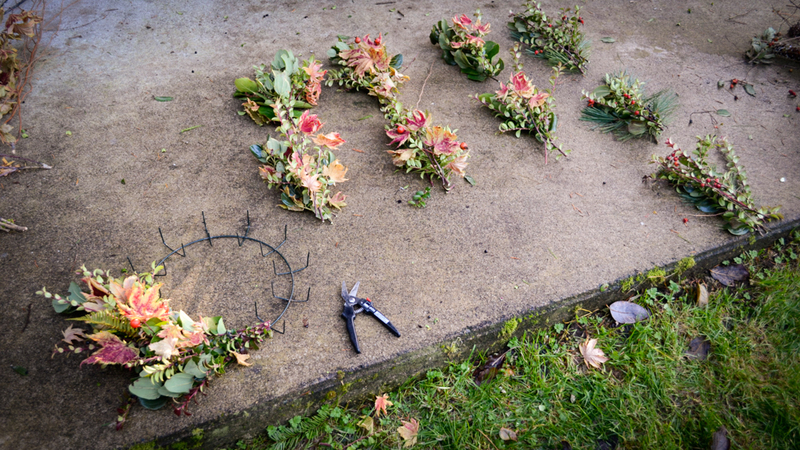 My wreath frame has twelve clamps. So I am going to do three rows of four (3 x 4 = 12). I could do six rows of two, or one row of twelve (all the mini bouquets would be the same if I did it that way). For this one, I am doing 3 x 4. You will understand why we do this later. I usually start with a base layer of ‘filler’ type material. 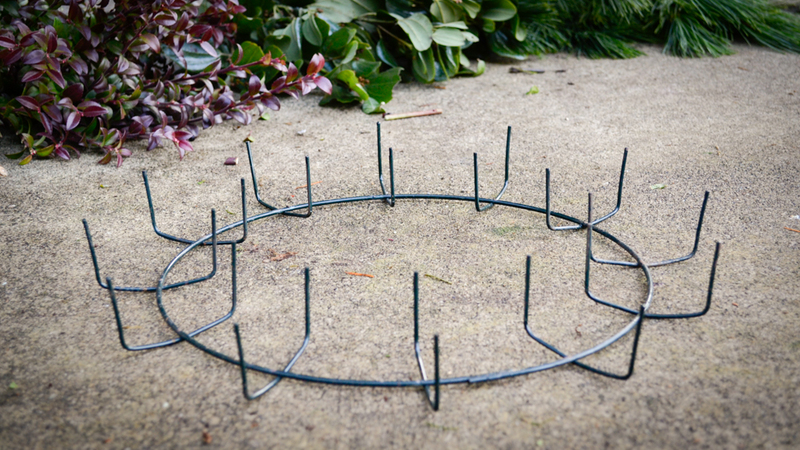 For a Christmas wreath, this is usually where you use your evergreen boughs. You may have something different in mind or on hand, or maybe you are doing one sold material. The point is to be creative. No two wreaths will ever turn out the same. Now lets start thinking about our bunches in terms of rows (side to side) and columns (up down). I have three rows of four, and four columns of three, on the one I am doing here. As we add our accent pieces we want to build up our columns (or rows, either way) evenly. So, for example, when I add the sword fern, I will add it evenly to each bunch in the column. And then on another column I will add the pine branches. And so on. The idea is just to distribute your materials evenly so that your wreath will be balanced and not lopsided. We now have our bunches all assembled. Our columns are balanced, and all the bunches are about the same size. It is time for the final step. Grab a bunch, situate it so that about three inches of the stems of your bunch go beyond the clamp, and then bend the clamps down securely on that bunch. Make sure you clamp it good and tight. Use your pruners to trim any stems that are sticking too far out. Repeat. I hung mine just like this. Of course, you could add bows, cones, etc… your call. 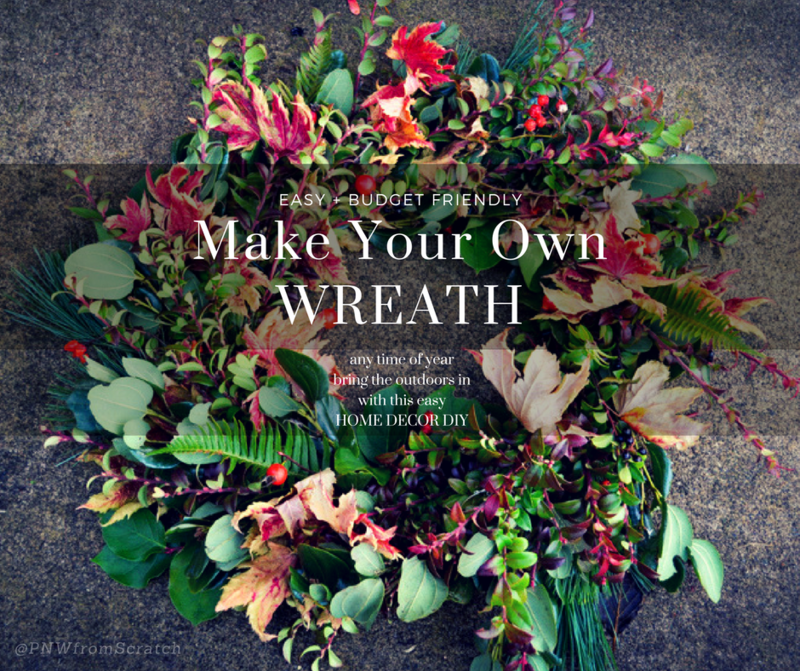 Your Wreath Making Imagination is the Limit! 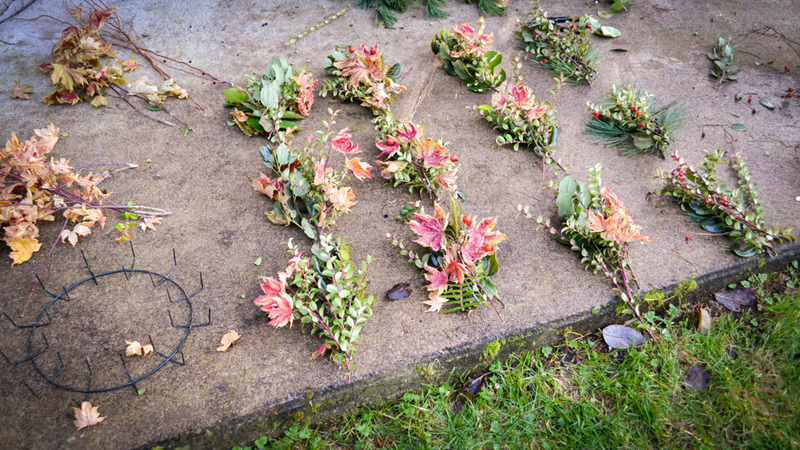 The fun thing about this wreath making project are the endless variations. Have fun with it! And then share with us! Please let is know in the comments how this turns out for you if you decide to try it, or if you have any questions! Post pics of your wreaths on Instagram and tag us… @PNWfromScratch! If you like this post, please share it! Your friends might like it, too! Here are a few of our Instagram #wreath favorites for more inspiration!